This jeweler uses PMC and teaches about this technique at Moëlan-sur-Mer, Brittany, France with Holly Gage. With the ring “Oh! 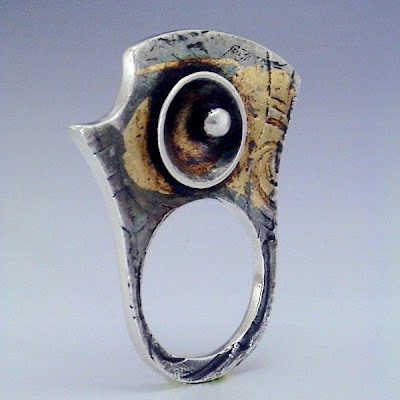 Ring” (the last image) she was named a finalist in the “Saul Bell 2010 Design Award“, metal clay category. Winners will be announced on June 5th. Good luck Angela! Aquesta joiera treballa amb el PMC i dóna classes d’aquesta tècnica a Moëlan-sur-Mer a la Bretanya francesa junt amb la Holly Gage. Amb l’anell “Oh! Ring” (la darrera imatge) ha quedat finalista del “Saul Bell 2010 Design Award” en la categoria de PMC, els guanyadors se sabran el 5 de Juny. Bona sort Angela! Crafthaus i el seu blog. This entry was posted by Montserrat Lacomba at 6:19 am. | This post has 2 responses. 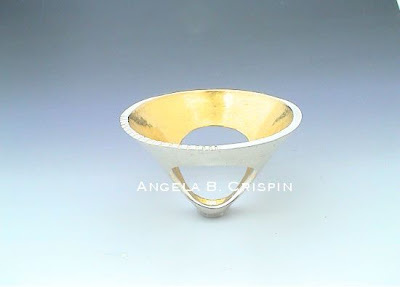 This post is filed under Blog, Brazil, France and tagged with Angela Baduel-Crispin, contemporary jewelry. Angela is an amazing artist! I really admire her work and wish her good luck too!